Currently with Firefox 1.0 PR, I use the following plugins: Web Developer, IE View, Blank Last, Mini T, Undoclosetab, and Tabbrowser Preferences. And I’ve stuck with the Qute theme for quite some time now. The Wikimedia Foundation announced today the creation of the one millionth article in Wikipedia. For more information, see the press release. I’m glad I was able to help. Boy, do I love wikis. Especially the Homestar Runner Wiki. Oooh, a pretty picture. 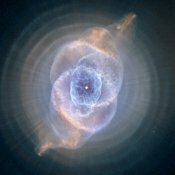 This is an image of the Cat’s Eye Nebula taken recently by the Hubble Space Telescope. If you like, you can check out the fullsize image. And there’s plenty more of other things if nebulas aren’t your thing. It kind of reminds me of Podz‘s chaos images. Cool stuff. I saw a few TV commercials this evening that I found interesting. None of them explained anything about the product being advertised, but they all ended with text on the screen that read “No matter what happens, don’t flinch. To be continued.” So of course, I looked it up. What I found was this: Buddy Lee – Don’t Flinch. The two I saw tonight were “Appliances” and “Centerfold”. They seem to be some sort of preview for the other ones: “Pretty Woman”, “Gawkers”, and “Hello”. What’s really interesting is the link to a fake weblog for the ninety foot babe. They even had her post about the upcoming commercials. It really looks like they put some effort into this. I’m guessing that at least one person had a great time thinking all this up. Whoever did the weblog must have had fun too. And it’s just one error away from being valid XHTML 1.0. This one is for Heather and Rob: Cooking for Engineers. It’s very interesting. Though I did happen to notice that the word “chocolate” only appeared six times over the course of almost three and a half months of posting. 17,000 employees for four months? I hear that Ken Jennings finally lost a game. It was taped this past Tuesday, September 7th. It reportedly was the seventy-fifth game he played. I know tonight’s show is going to be his forty-second win, so it looks like we are several few weeks away. Here’s to Ken and the two and a half million dollars he’ll have in late October. Good job.